Medal: "United Hearts Scapular Medal" 5 Pack. 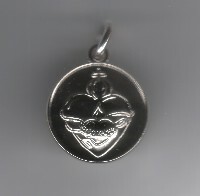 Medal: United Hearts Scapular Medal (Silvertone/Shiny) 5 Pack. This powerful medal acts as a barrier against evil. 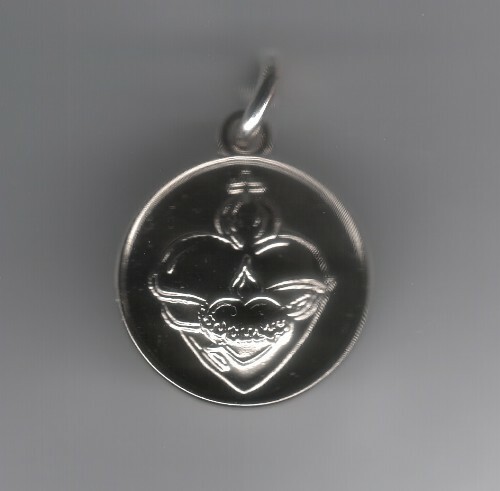 The front of the medal shows the image of the United Hearts of Jesus and Mary with an inscription on the back of the medal which reads United Hearts of Jesus and Mary, Triumph and Reign. * It is a barrier against evil, dispelling conflict and confusion in the heart of the one who wears it. * It will lead the soul into the embrace of Our Two Hearts. * It will bear with it a conviction of heart, revealing to the wearer unproclaimed faults. Thus the soul will be led deeper into holiness. * Those who faithfully wear it shall be embraced in Holy and Divine Love and shall not die an unprovided death. Silvertone, shiny medal. Pack of 5 each.